A Bristol based manufacturer of tools and care products for the motorcycle industry is reaping the reward of its aggressive export drive, with international sales now representing 50% of its business. Tru Tension, which launched in 2015 across the UK, America and Australia, quickly moved to expand its international reach. With the support of Comtec Translations, Leamington Spa, which provides invaluable language support to exporters moving into new markets, the manufacturer successfully established itself as a distributor in Germany and France. 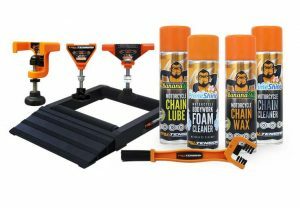 With innovative chain and belt tension tools and products including Wheel Monkey, PrimeShine Cleaning Products, BananaSlip Lubricants and the highly anticipated Belt Monkey, which launched in 2016, having a fully localised website together with supporting marketing material, in the language of their target overseas customers, was essential for the success of the brand in new markets. Founder and director, Chris Frappell explains: “For us, working with a quality translation partner was vital if we were to fully maximise our international sales – we need to be able to demonstrate our understanding of both the language and culture in the countries where we sell our products and Comtec has been key in achieving this. To date Comtec has developed everything from website content to product brochures, voiceovers and subtitles for online product tutorials and even social media posts for Tru Tension. Such support, which effectively demonstrates the strengths of the brand and the products, has helped the manufacturer secure substantial new overseas distributors, including in Germany where they have recently had their products listed in 80 Louis Motorrad stores. Tru Tension plans to launch in a further 10 international markets by 2020, maximising the year-on-year global increase in motorcycle sales. Its wide reaching international success has also enabled the company to invest in the development of new products, expanding the range to include a number of high performance lubricants and cleaning products specifically for the motorcycle industry, which are now sold by some of the largest motorcycle chains in the UK. Sophie Howe, managing director at Comtec Translations comments: “Employing the services of qualified, experienced translation experts enables our clients to successfully increase international sales. For further details on the Motorcycle products and tools available from Tru Tension please visit www.tru-tension.co.uk.